Learn how to take your real estate website to the next level, without spending lots of money! Whether you have had a website for 15 years, 15 minutes, or are about to start one, you need this book. Learn all the tricks to make your site searchable, findable, and profitable! Select the right type of website, add photos, enhance text, this book gives you step by step instructions to take a basic website and make it powerful! 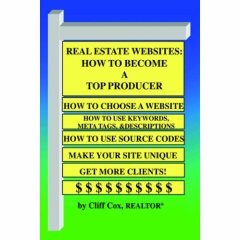 Even if every agent in the world uses this book, no two sites would be alike! The changes you choose to make are entirely up to you! Learn how to pick effective domain names, questions to ask before signing, what layouts works best when. Discover meta tags, titles, descriptions; find out how to maximize your presence online. Walk through source coding, what it does, how it can be added, and what impact tags can make to your site. Learn how to take advantage of your business card of the 21st century!